ROLLE, Switzerland (August 27, 2015) – Following a successful first year as the Official Automotive Sponsor for the UEFA Champions League, Nissan’s partnership has been extended into all global territories for the next three seasons up to 2017/18. The announcement of the deal comes ahead of the UEFA Champions League Group Stage draw today and will see Nissan activations – such as TV broadcast sponsorships around live UEFA Champions League matches – taking place across a further 40+ countries including Brazil, China, Japan and the USA from this season. Once again, fans will be at the heart of Nissan’s partnership as it looks to engineer unexpected moments of fan excitement to enhance their experience of Europe’s most prestigious football competition. Starting this season, Nissan will also have the exclusive rights to offer fans the opportunity to be a Centre Circle Carrier, offering over 1,300 children across European territories the chance to get even closer to the action and their footballing heroes. This money can’t buy experience will see them become part of the opening ceremony, carrying the iconic UEFA Champions League emblem on to centre of the pitch ahead of each match in front of a worldwide TV audience of millions. In addition to the Centre Circle Carrier activation, people across the globe will also be able to have their say on some of the greatest moments from this season’s UEFA Champions League through Goal of the Week. The competition enables fans to vote on their favourite goals from every match week for the chance to win a range of prizes from official match balls, tickets and even an opportunity to go to the Final in Milan on 28th May 2016. In conjunction with the UEFA Champions League Group Stage Draw on August 27, Nissan will be offering two passes to a lucky fan to watch their favourite team in every UEFA Champions League fixture this season. The #ChampionsKey social media activity will launch with a new video featuring the Nissan GT-R and invite people to enter by tweeting the hashtag. 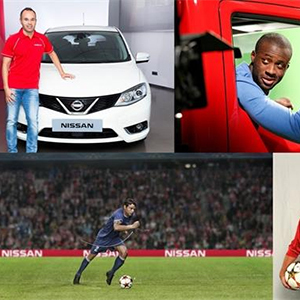 Nissan continue their partnership with official Nissan UEFA Champions League ambassadors, Andrés Iniesta, Thiago Silva, Yaya Touré and Max Meyer for the 2015/16 season. This will cover various activities from appearing in Nissan TV and print commercials, personal appearances and other activations throughout the year.